Seven years ago he made history in the Formula BMW series, at the weekend he created motorsport history once again – this time in Formula One: Sebastian Vettel became the youngest driver ever to defend his title in the Formula One World Championship. Vettel’s route to the top took him via the Formula BMW championship, which he won in style in 2004 with 18 victories in 20 races. The most successful Formula BMW driver to date also claimed 14 pole positions and set 13 fastest laps. The talented young driver also made his Formula One debut with BMW. In 2006 he was named test and reserve driver for the BMW Sauber F1 Team and went on to become the youngest driver ever to win a World Championship point at his very first race outing in Indianapolis in 2007. However, BMW allowed Vettel to switch to the Scuderia Toro Rosso team that same season, where he took a regular driving position. He sensationally won the Italian Grand Prix with this team in 2008, his first of 19 Grand Prix victories. Since 2009 he has been a member of the Red Bull Racing team and has now celebrated his second World Championship title in a row. 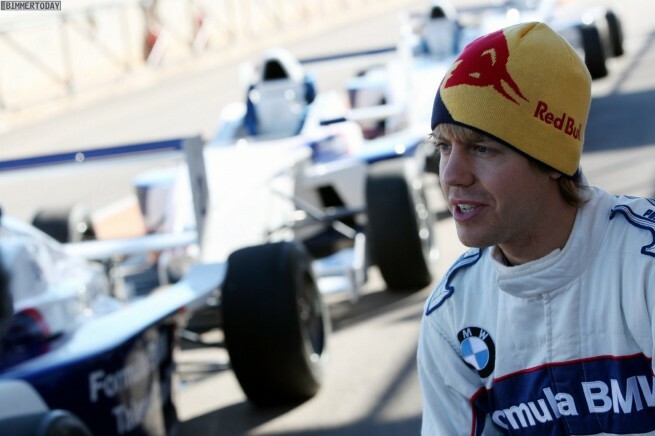 Vettel has never forgotten his roots and still enjoys a close association with Formula BMW. At the end of 2010, in the week following his first World Championship success, he visited the scholarship course for the 2011 Formula BMW Talent Cup in Cartagena, Spain. Whilst there, he was more than happy to offer the participants of the BMW promotion programme helpful tips and advice. Alongside Vettel, the 2011 Formula One season also featured a further seven drivers who learned their trade in Formula BMW: Nico Rosberg (DE), Bruno Senna (BR), Timo Glock (DE), Adrian Sutil (DE), Sergio Pérez (MX), Sébastien Buemi (CH) and Daniel Ricciardo (AU).